regrettable remake of his 1984 "Frankenweenie." 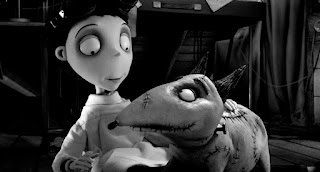 "Frankenweenie"'s premise sounds like the setup for an offbeat but potentially heartwarming tearjerker. A friendless boy whose dog is hit by a car miraculously brings his beloved pet back from the dead, but indications are that the resurrection may be only temporary. Unfortunately, famously quirky director Tim Burton can't do a similar job of bringing this miserable movie's bloated, detached and stiff-as-roadkill screenplay to life for even 87 minutes. 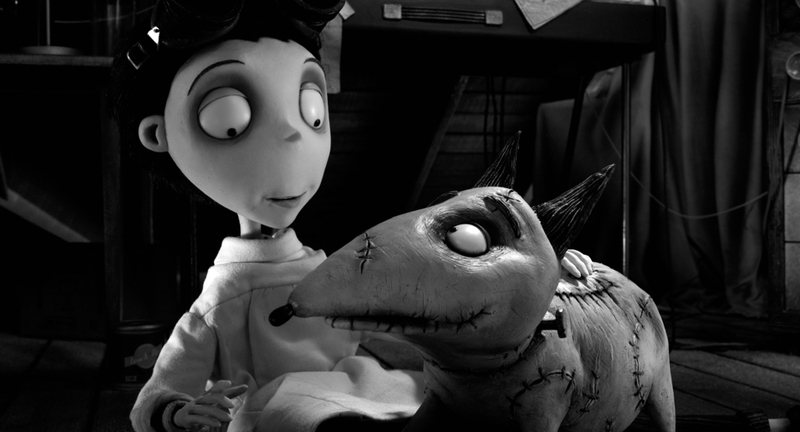 The new feature-length and stop-motion-animated "Frankenweenie" is a creepy and ploddingly padded remake of the charming live-action half-hour film of the same name Burton directed in 1984. Both are in black and white. That choice made sense for the original, which was set in the exercise-leotard '80s but harkened back to the look of 1931's "Frankenstein." Depriving the 2012 puppet-animated version of color, however, only makes it look drearily drab, self-consciously arty and high-falutingly kid-unfriendly. "Frankenweenie" also has the misfortune of arriving in theaters too soon after the release of this summer's "ParaNorman" to avoid unfavorable comparisons to that far superior fantasy. Both are stop-motion animated 3D horror/comedies about precocious loners triumphing over the re-animated dead. But "ParaNorman" is more interestingly animated, has a livelier voice cast and is more colorful (in both senses of the word) than the haltingly jerky, droningly dull and boringly monochromatic "Frankenweenie." The concise and affectionately tongue-in-cheek 1984 version of "Frankenweenie," written by Lenny Ripps from an idea by Burton, was better than the 2012 incarnation in every way but one. Aside from giving 10-year-old Victor Frankenstein's dog Sparky a more plausible reason to chase a ball into the street, everything new about the regrettable redo (scripted by John August) feels insultingly misguided. August's previous credits include the screenplays for Burton's "Corpse Bride," "Charlie and the Chocolate Factory" and "Big Fish." The most off-putting addition is the presence of future-predicting cat poop, shown in all of its disgustingly graphic glory. The most utterly wrongheaded plot enhancement turns several other kids' pets into freakish, town-ravaging monsters for a huge action finale, subverting the tone of what should have stayed a strange but simple boy-and-his-dog fable. One image sums up the new movie's bigger-but-not-better philosophy. In the 1984 "Frankenweenie," a miniature golf course windmill amusingly evoked the setting of the 1931 "Frankenstein"'s fiery climax. The new "Frankenweenie" substitutes an actual full-size windmill that's supposed to be some kind of town landmark, robbing the scene of anything resembling cleverness. That's a shame, because many of the remake's early bits are respectfully faithful recreations of their live-action counterparts. Victor's amateur movie starring Sparky, an odd pet cemetery full of descriptive gravestones and Victor's elaborate attic laboratory are nearly shot-for-shot copies of scenes and sets from the 1984 film. The first "Frankenweenie" featured Barret Oliver as Victor, Shelley Duvall and Daniel Stern as his parents, a young Sofia Coppola (credited as "Domino") as a neighbor and Paul Bartel as Victor's science teacher. The voice cast for the new version includes a nicely understated Charlie Tahan as Victor, Catherine O'Hara and Martin Short in multiple roles including Victor's parents, the reliably deadpan Winona Ryder as the renamed neighbor and Martin Landau as a far more theatrically grandiose teacher. While the thoroughly enjoyable 1984 original is worth seeking out, the new "Frankenweenie" is a misguided experiment gone horribly wrong.